Nadi Legends Club (Fiji Soccer): PICTURE GALLERY: Fiji Football Veteran Players' Dinner, Nadi, Saturday, 4 October 2014 + misc. pics. PICTURE GALLERY: Fiji Football Veteran Players' Dinner, Nadi, Saturday, 4 October 2014 + misc. pics. Nadi 4 defeated Tailveu-Naitasari 0 in the first match of 2014 IDC @ Prince Charles Park, Saturday, 4 October 2014. This game showed the huge gap in class between the top six or seven teams (Nadroga is borderline) and the next group of teams such as Navua and Tailevu-Naitasari. This is a perpetual problem for Fiji football. It was here 30 years ago and is still a problem today. Perhaps new clubs should be formed in places such as Namaka, Saru, and Sabeto, and/or there should be a second Suva team. These teams might make up a more competitive bottom half of the national league. Left to Right: Top row: Master Tale; Shiu Naicker; unknown; unknown; and Ronald Mair (green shirt) (partly hidden). Bottom row: Unknown; Mahend Singh (President Nadi Legends); Vilikesa Driu (seated, red shirt); Henry Dyer; and Lepa Tora (black-and-red shirt). 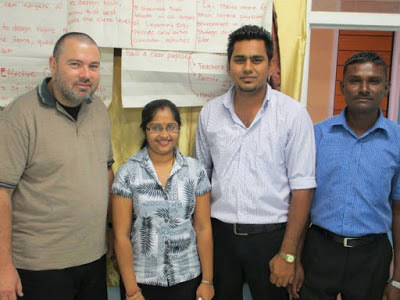 Left to Right: Top row: Master Tale; Shiu Naicker; unknown (hidden from view); unknown; and Ronald Mair (green shirt). Bottom row: Unknown; Mahend Singh (President Nadi Legends); Vilikesa Driu (seated, red shirt); Henry Dyer; Lepa Tora (black-and-red shirt); and Talak (green shirt). Left to Right: The same crowd with Savenaca Taqa (second from left) and Waisake (third from left). Left to Right: Inosi Tora; Mahend Singh (President); John Andrews from Savusavu (playing in the USA now); Henry Dyer; and Savenaca Waqa. Former Nadi players were very happy with Nadi's 4-0 win over Tailevu-Nautasiri in the first game of the 2014 IDC which was played earlier that evening. With the Ba boys. Left to Right: Unknown, Henry Dyer (Nadi), Lote Delai, unknown, and unknown. With the Ba boys. Left to Right: Unknown, Henry Dyer (Nadi), Lote Delai, unknown, and unknown..
Left to Right: Henry Dyer; Savenaca Waqa (Nadi and Fiji Goalkeeper); and Seremaia Tale (also former Nadi and Fiji Goalkeeper from a later era). Lote Delai standing with the Ba crowd. Lote Delai made the pass to Ravuama Madigi who scored Fiji's goal in the 1-0 win over Australia in 1988. Henry Dyer (left) and Josefa Masilagi. Josefa is a former Tavua and Ba soccer rep. He now resides in New Zealand. Left to Right: John Andrews (residing in the USA now); Henry Dyer; and Shiu Naicker (former Nadi soccer rep in the early 1980s). John Andrews played for Savusavu and Fiji before moving to the USA. Henry Dyer (fourth from left) among the Ba players. Left to Right: Lorima Batirerega; Henry Dyer; John Andrews; and a Team USA soccer official. Left to Right: Back row: Unknown; Shiu Naicker; Inosi Tora; Team USA official; Team USA official; Team USA official; and Vilikesa Bola (red shirt) (former Rewa and Lautoka soccer rep). Front row (seated): Savenaca Waqa (former Nadi and Fiji Goalkeeper). Savenaca Waqa kept the clean sheet in Fiji's 3-0 win over Newcastle United in Suva in 1985. Lote Delai (first on left) with the Ba crowd. Henry Dyer (left) and Lote Delai @ Veterans' Dinner organized by Fiji FA, 2014 IDC. Lote Delai made the pass to Ravuama Madigi who scored Fiji's goal in the 1-0 win over Australia in 1988. Henry Dyer (left) and Wally Mausio (former Lautoka soccer rep) @ Lautoka Club looking towards Namoli Village side, 2014. At the 1982 IDC Dyer played for Nadi while Mausio player for Lautoka. BA TOH BA HAI. Henry Dyer back at the scene of some of Nadi's greatest victories and saddest defeats @ Govind Park, Ba for the Ba versus Lautoka match one Sunday afternoon in 2014. GO NADI GO. Former Nadi and Fiji reps Henry Dyer (left) and Inosi Tora @ Namotomoto Village, Nadi, late 2014. Henry Dyer (left) with the family members of Inosi Tora @ Namotomoto Village, Nadi, late 2014. Henry Dyer @ Central Club in Ba.